UMD team members and graduate students Luis Santos and Maia Naftali with Stephen Clarke, Marion County Health Department and Chris Gudas, Johns Hopkins University. 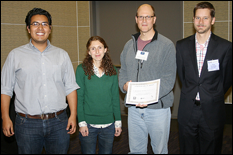 An interdisciplinary team from the University of Maryland (UMD) won first place in the 2013 American Public Health Association's (APHA) Codeathon aimed at helping to implement the Affordable Care Act (ACA) at APHA's Annual Meeting and Exposition held November 2-6 in Boston. The event's challenge, APHA for ACA: A Codeathon to Help Implement the Affordable Care Act, brought together developers, designers, practitioners, students, public health professionals and innovators to develop applications and tools to support public health agencies and organizations in implementing the ACA. The UMD team, Terrapin Health Transformers & Friends, was sponsored by the Center for Health Information and Decision Systems (CHIDS) at the Robert H. Smith School of Business and led by Kenyon Crowley, deputy director of CHIDS. The team included Department of Mechanical Engineering graduate student Luis Santos from the Hybrid-System Integration and Simulation Lab directed by Dr. Monifa Vaughn-Cooke and graduate student Maia Naftali from the College of Information Studies iSchool's Human Computer Interaction Lab. Santos provided the team with expertise in human factors design applied to health information technology while Naftali specializes in usability and interface design with an emphasis on technologies for persons with disabilities. The UMD team was also joined by health care professionals from Johns Hopkins, the Marion County Health Department and the United States Substance Abuse and Mental Health Service Administration (SAMHSA), who lent their knowledge and expertise to the development of the team's winning solution, ACA Benefits Buddy. The ACA Benefits Buddy is an easy to use application designed to connect users to preventative health benefits available under the ACA. The suite of integrated components provide users with easy to understand information on preventative benefits tailored to the individual through a simple algorithm. "This project is a great example of UMD's interdisciplinary collaboration efforts to advance healthcare. Human factors design techniques will play a large role in the changing healthcare landscape to insure that products such as Benefits Buddy meet the individualized usability and accessibility needs of the patient population," said Vaughn-Cooke. ACA Benefits Buddy would be available as a community-based engagement system, where users could see benefits available from ACA, learn about self-administered health status checks and schedule services in addition to accessing tools for handling health insurance benefits and connecting with support resources. The UMD team also received an honorable mention for utilizing geospatial data to prioritize how ACA Benefits Buddy should be deployed. Using ESRI ArcGIS mapping and analysis software, the team evaluated demographics such as uninsured rates, internet usage, unemployment rates and other geocoded data to create a strategic roll-out plan for the Benefits Buddy app to target higher-needs communities first. UMD Team: Foreground - CHIDS Deputy Director & Team Lead, Kenyon Crowley (right) with USPHS and SAMHSA Commander Cynthia Rubio (left); Background - Graduate students Maia Naftali (left) and Lui Santos (right). "I'm very proud of our team, which was able to merge insights from a number of fields and APHA's ACA experts that were on-hand, and rapidly prototype a solution that has promise for improving health literacy and access to free preventive services that were generally unavailable pre-Accountable Care Act," said Crowley, "We are working now to leverage the University of Maryland's outstanding innovation and entrepreneurship resources to move this winning prototype to production." According to Santos, there are already professionals in the health care field interested in implementing the ACA Benefits Buddy. For more information on APHA for ACA: A Codeathon to Help Implement the Affordable Care Act (ACA), visit their website.